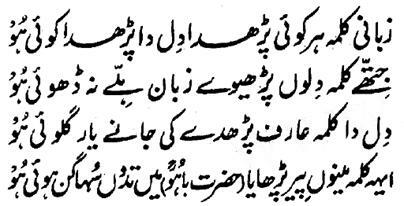 Hazrat Sultan Bahu Rahmatu-Allahe Ta-aala Alaihe says that it is everyone who reads the Kalimah verbally but very few are those who read the Kalimah cordially. Where Kalimah of heart is read, there no movement of tongue is done. Zaakir hears the voice of the Zikr of heart in due consciousness and sense that his heart is doing Zikr aloud. Some people attend towards their hearts after doing Habs-e-Damm and hear the tip lup sound of the pumping of blood in heart and a movement is felt in all organs because of the flow of blood in vessels. They consider this thing the Zikr-e-Qalbi. If this is the Zikr-e-Qalbi, then such Zikr is also present in Kalb, that is, dog and all animals alike. However, when the original Zikr-e-Qalbi initiates, the Arsh e Mualla shows movement with mercy and affection and the Angels envy saying that 'would that there were humans and were able to do Zikr on earth like this'. Allah Almighty, as gesture of His Pride and Pleasure, addresses the Angels that 'O Angels! See the condition of My earthly slave that he is lying slept before the people but in what manner his heart is commemorating Me. This was My Secret of creating the human being'. Then he says that the Kalimah of heart is read by the Arifeen. What will a sensual and talkative person know these things! 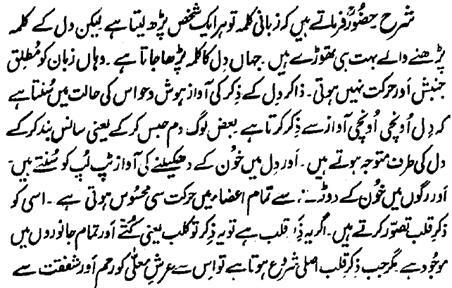 When we were made to read this Kalimah by our Pir, we became the People of Happenstance and Fortune.